Handmade wooden products and furniture are precious items that can last a lifetime. 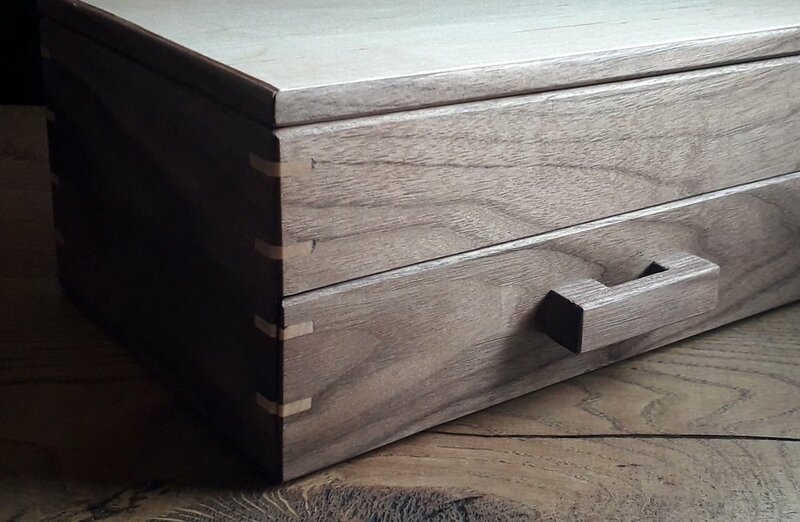 Some of our recent work is detailed below - other commissions we've fulfilled include furniture such as coffee tables, a writing desk and makeup chests, to luxury pieces such as chessboards and keepsake boxes. If you'd be interested in commissioning a bespoke item, or want a more personalised version of a product we already offer, send us an email and we'll be happy to discuss your needs. The box uses a relatively simple design, allowing the figure of the wood and the contrasting colours to stand out. American Walnut is used for the shell, with American Maple used for the lid, bottom and interior shelf. The corners of the box use mitred joints, with maple keys inserted for aesthetic purposes. The interior dividers are a mixture of maple and European Oak, with an Oak trim used inside the lid to create a tight fit when closed. The exterior was finished with multiple coats of Danish Oil before buffing to a high sheen, and the interior was lined with thick maroon felt. An unusual but interesting request, this box was built to house smoking paraphernalia, and includes plenty of storage for the customer's needs. The chest was built from solid European Oak, with hand-cut dovetail joints visible on the exterior. The surface was finished with an oil coat, polished to a high satin, with solid brass hinges and latch. The interior of the box was lined with maroon velvet, and a tight-fitting wooden lip creates an almost airtight seal for the contents. The initials of the customer are engraved on a plaque inserted into the lid. This maple writing desk was commissioned and built over a number of months, with the light, creamy colour of maple chosen to compliment the simple and geometric design. The desk has multiple drawers, including a drinks holder and room for pens, stationery and papers. The quoted text was chosen by the client and engraved by LaserFlair, who we would highly recommend. The graphic was also chosen by the client and transferred to the desk surface using a print of the graphic and transfer medium, before distressing to achieve a worn look. This was then sealed, along with the rest of the piece, with multiple coats of oil, sanded and buffed between coats. The drawers are to be lined with maroon velvet and drawer pulls to be confirmed by the client before delivery.